As the 2005-06 National Venturing President, Amy DiFrancesco received requests for Venturing Courts of Honor. Just as each crew focus is individual, their ceremonies are unique. And yet, these resources might assist new crews in designing their first awards ceremonies. Below are samples of ceremonies with different approaches. If you modify any of the ceremonies, I would enjoy posting it for others. So, if you have a ceremony that you would like to share, please send it to Craig Murray at TheHiker@SageVenture.com or contact me from my contact page. Howie Barnes, Crew 313 Advisor, Seneca Waterways Council, wrote this helpful officer installation ceremony. Ken King shared this induction ceremony posted on BSA's site but I have to say that it is not something that most Crews would do. Certainly a Cub Pack might and maybe a Boy Scout Troop but I will share it in any case. Mark Andrew, Crew 2157 Advisor out of Holland, MI, posted this less 'heavy' induction ceremony on the Venturing List. It uses wording from the new Venturer's Handbook. A small number of the the Silver/Summit knots have been privately made with the knot itself being stitched in silver Mylar. It would be a great gift for anyone earning either award. They are $5 each plus a self addressed stamped envelope. 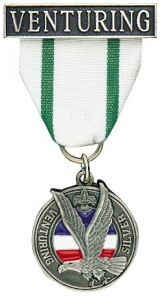 Also available is the Venturing Leadership Award knot for $3 and a self addressed stamped envelope. The square knot itself is the traditional design that BSA uses for most of its knots. If you want to honor someone with a very special knot, please contact SageVenture on his contact page or by email at TheHiker@SageVenture.com.